Buying a vehicle is one of the most important purchases a person can make. Choosing the wrong car can cost you hundreds and thousands of dollars down the road. Before purchasing a car, it’s important to figure out exactly what you need, what you’re looking for and how much you’re willing to spend. That’s why the Microsoft car buying checklist is such a valuable tool. 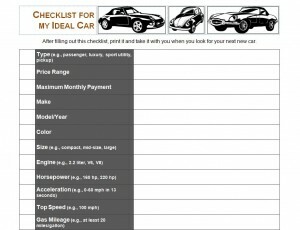 When considering the options, type in or jot down what you want in each corresponding box in the car buying checklist. Once you have finished filling the car buying checklist out, you can print it off and take it along as you search for a new or used vehicle. When a car has the options and specs you’re looking for, simply check the box next to the corresponding category. A great way to make the most of the car buying checklist is to print off or make several copies of it. Take them out for a day and look at several different vehicles. Place the title of the vehicle at the top of the page and compare notes from each car buying checklist after a day of shopping. That way, you’ll have a complete overview of all of your options. Take some of the stress out of looking for a new or used car with the car buying checklist template from Microsoft. Download and print it for free today!